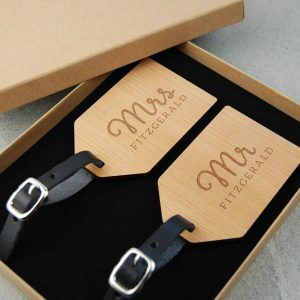 A stunning wedding gift for a newly married couple as they embark on their lives and honeymoon together! 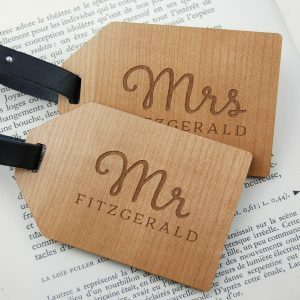 A set of two wooden luggage tags engraved as Mr & Mrs. 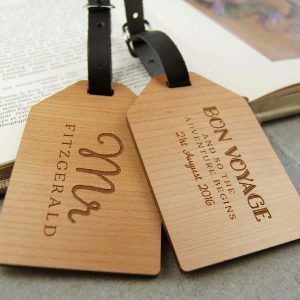 The back of each tag features the phrase ‘Bon Voyage’ and uou can also further personalise the luggage tags by adding a message of your choice to the back. This could be a message of best wishes to the happy couple, the date of the wedding or a fun and romantic quote. You can choose up to 100 characters and this will be laser engraved at the back of the tags. Custom made from sustainably sourced solid 6mm Alder Wood in our Dublin workshop. The two luggage tags will arrive beautifully packaged in a branded gift box. Each tag is attached to a short leather strap with a metal buckle, allowing you to easily and securely attach it to your bag or suitcase. The tags measure 85mm x 55mm and the leather strap has three holes allowing it to be fastened at different lengths.